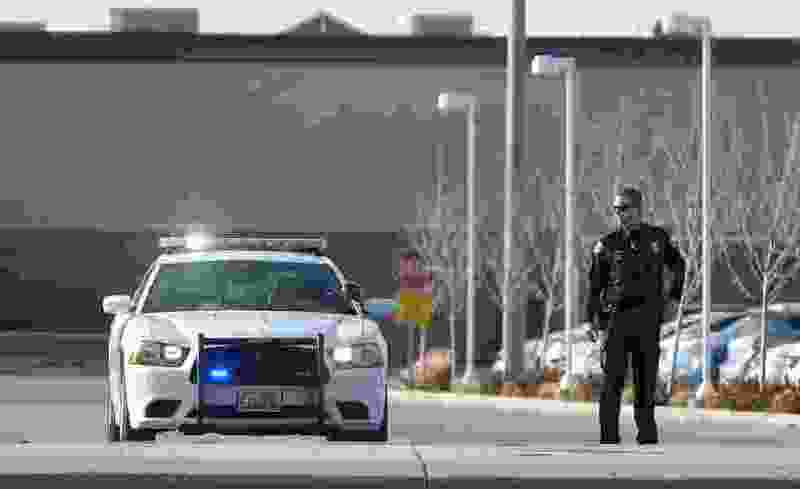 (Francisco Kjolseth | The Salt Lake Tribune) Police block an entrance to Fashion Place mall after a shooting on Sunday, Jan. 13, 2019. Before two rival gangs fought outside of Fashion Place — firing shots that sent mall shoppers running in panic and racing to hide in backrooms last week — the groups bumped into each other at a sports apparel store. As members of the Florencia 13 gang looked around at the jerseys and baseball caps, they recognized members of the Norteños gang and decided to challenge them to a fight. They argued over how it would go down until, just outside the glass doors of a southeastern entrance of the Murray mall, a Florencia 13 member pulled out a pistol and fired. He hit a man three times in the abdomen and the legs and a woman once in the leg. Then, the two remaining members of the groups fled. On Tuesday, police continued to search for the 17-year-old who shot the gun. And charges were filed against five Florencia 13 members who were there, including the man who allegedly advised the youngest member of the gang to fire, according a statement from a responding officer. Steven Perez-Hernandez, 18, whom the documents describe as the instigator who gave the directions, faces felony charges for discharging a firearm, obstructing justice and causing a riot. He was turned in by another member of his gang who police caught in the early morning following the Jan. 13 shooting at 6191 S. State. Flaviano Aguilar, 20, and Jorge Luis-Crecencio-Gonzalez, 19, were charged with obstructing justice and rioting. And Arian Huerta, 20, and Jesus Joshua Payan-Mendoza, 19, were charged with rioting. All of the charges could have penalties enhanced for gang involvement if convicted. All of the individuals have criminal histories that mostly include traffic tickets. All are being held at Salt Lake County jail. Before he was arrested, Aguilar told police that he had sent money to the 17-year-old to help him and another member continue evading police. The charging documents offer some details that police have not previously released about the case including: the name of the rival Norteños gang, where the two groups first met, exact numbers for how many were involved on each side, who officers are still searching for and where and how many times the victims were hit. The injured man and woman were transported to the hospital. The woman was soon released, and the man was in stable condition after surgery. There have been no further updates on their conditions. Including those two, there were four members of the Norteños gang involved in the fight based on surveillance video. One man fired several bullets at the Florencia 13 group after the 17-year-old fired, but he did not hit anyone. There were seven members of the Florencia 13 group, including the five arrested and charged, and the two still on the run — identified by the initials A.G. and L.M. because they are minors. Hundreds of shoppers and employees ran in terror after hearing the gunshots. Many hid inside stores. Some feared it was a mass shooting. A few people helped the two victims by applying tourniquets.